We’ve been putting it off, but with the MoT on our English car due in little over a week, we just can’t leave it any longer. Time to pack up a few things and leave our little corner of paradise for a short while. Joe spent our last evening watering, tidying up outside and generally battening down the hatches while I, because it was such a fantastic evening, took a few photos and did the usual girlie things. How could one leave such a place, even for a little while? 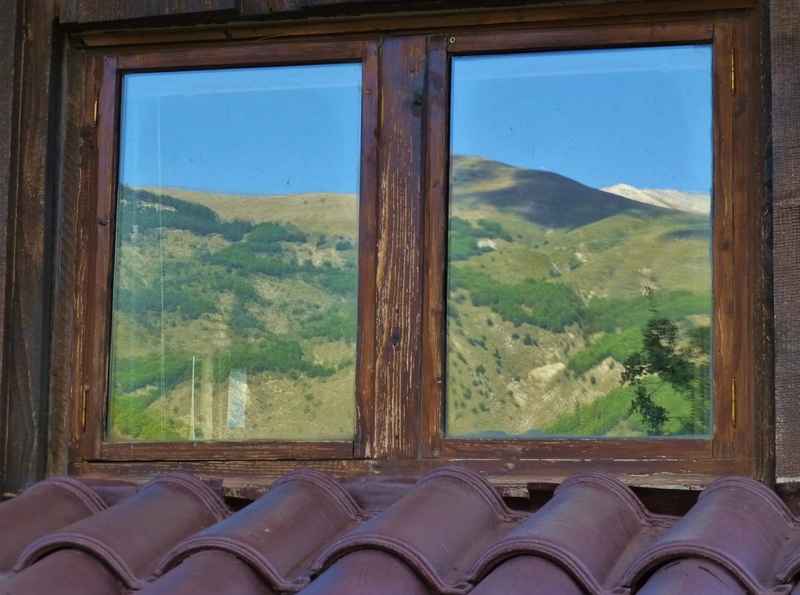 This view of the mountains reflected in the bathroom window taken on our last evening may give an idea of what we were about to miss. 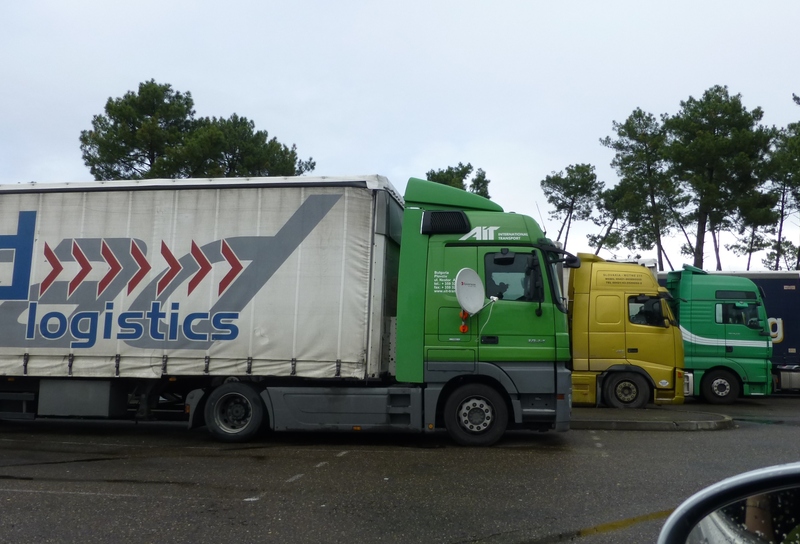 We have been doing the long run back to England for the last seven years, sometimes twice a year (and back), and it still doesn’t get any shorter; 1550 miles from Bath via Dover to the south of Spain. It can be done in 26 hours without any breaks, but increasingly, we’ve treated ourselves to some overnighters. 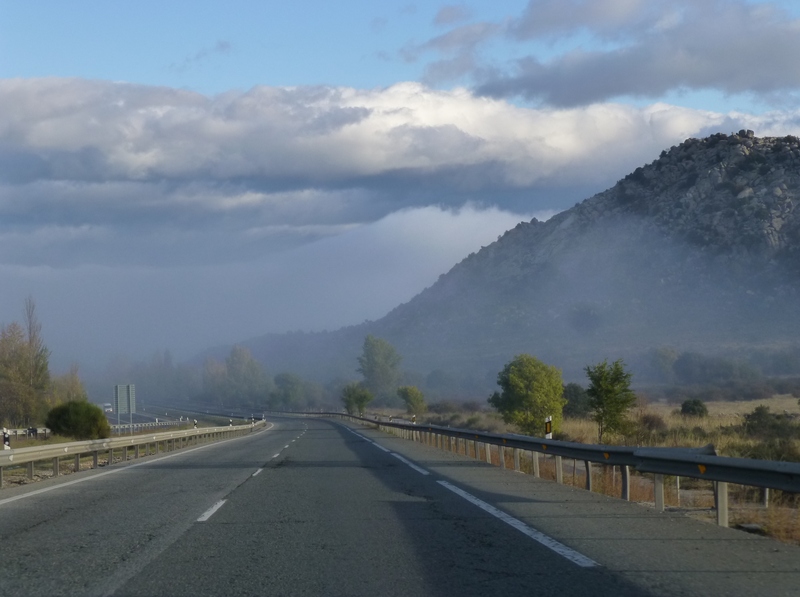 We started out much later than usual and the spectacular weather continued all the way until we got to our first night stop, Casa Juaneca, about 20 miles north of Madrid. Forsaking our usual vegetarian fare we tucked into an excellent solomillo (sirloin steak). Next morning, brilliant sunshine but patchy fog, lots of warnings about “banks of fog” and “reduce your speed…”. 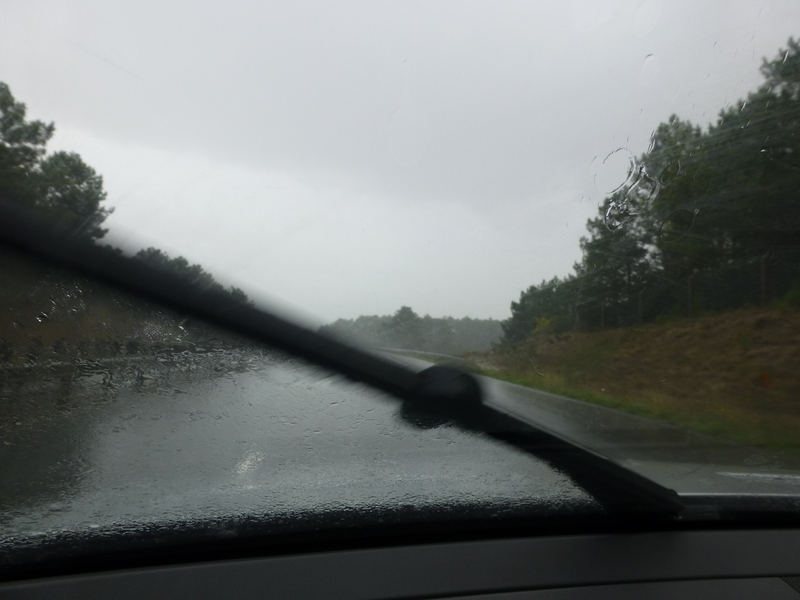 Then the rains started and continued for the rest of the journey. 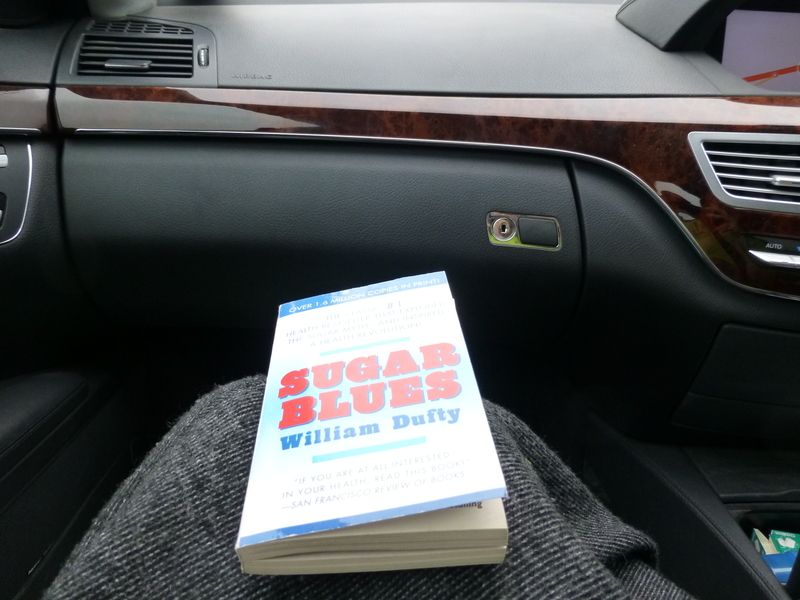 As usual, we made our own amusement – lots of worthwhile conversations usually prompted by something noticed along the journey interspersed with music; ‘comfort’ breaks; raiding the coolbox for salad, quiche and curry pasties, other calories and fruit; lots of tea and coffee; and me reading aloud almost half “The Sugar Blues” by William Dufty. Wonderful, thought-provoking stuff that sparked off more conversations. 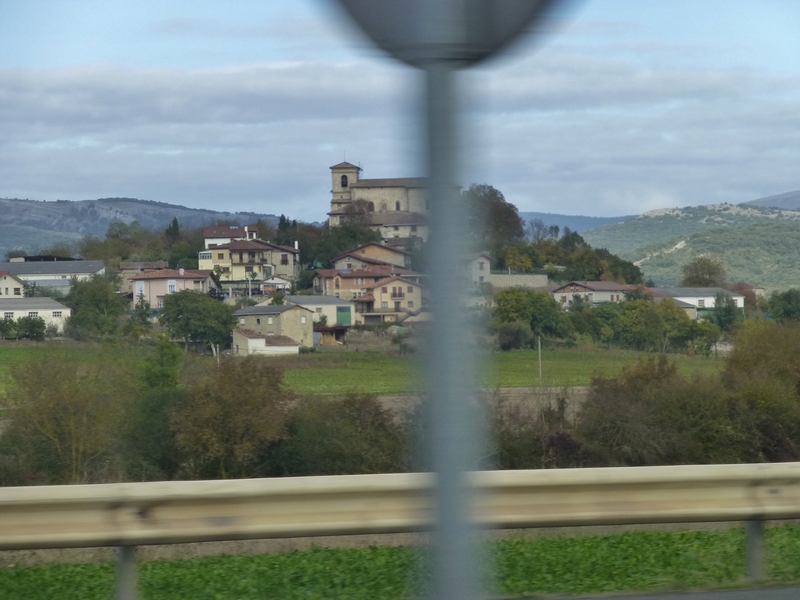 The journey is almost routine now, and because we go on the Peájes (toll roads) we see the bigger picture – huge swathes of countryside unfolding all around us – and never cease to marvel at the size and beauty of Spain and France. 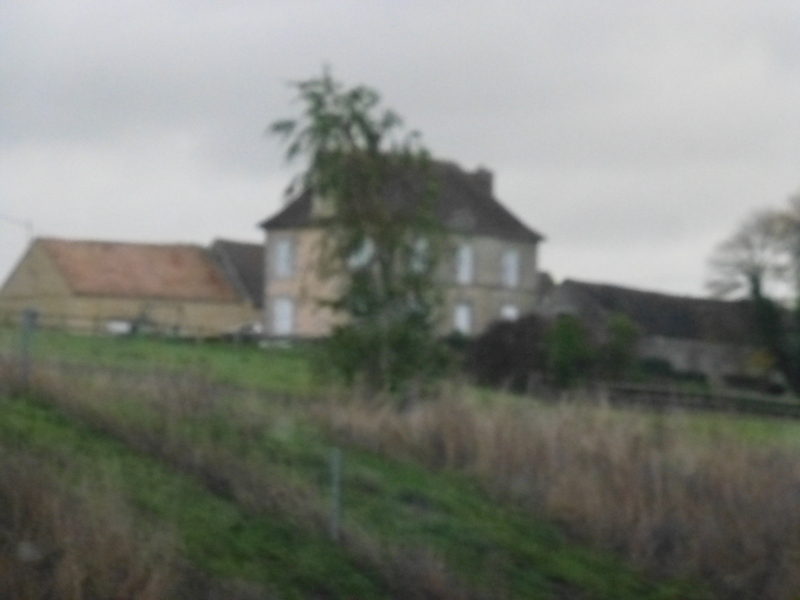 So, not many picturesque little villages to take photos of but I had the camera ready on my lap – just in case. 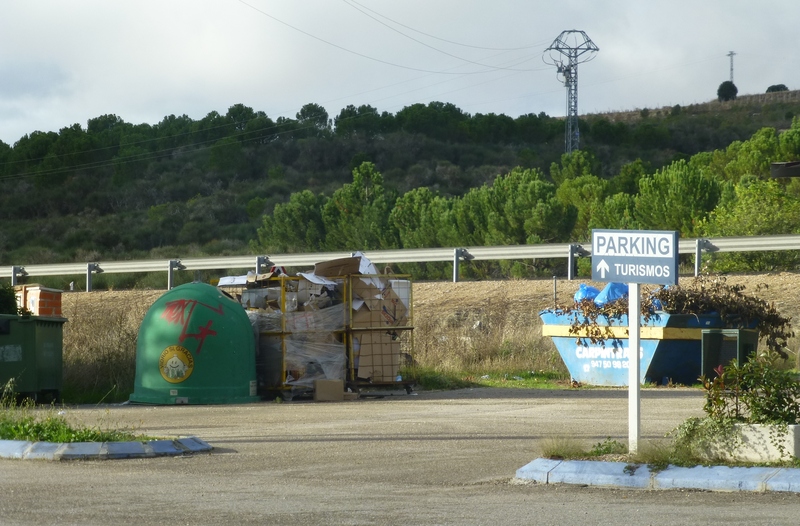 There was quite a smart looking services forecourt but the parking area specially for tourists (“Parking Turismos“), was especially unattractive full of overflowing waste bins. Not surprisingly there were no takers; it looked like you’d catch something if you decided to park there and get out your sandwiches. 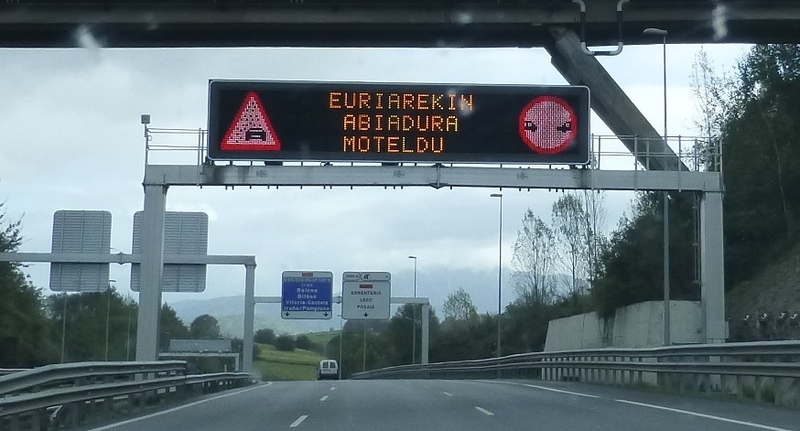 Entering the Basque country on the way to San Sebastian, the road signs start once more to morph, this time into random unintelligible and unpronounceable hieroglyphs; luckily there is a picture on this one so we can get an idea of what it means. I know it’s an ancient language, but it’s ugly on the eye! The Spanish seem to have a penchant for morphing road numbers. 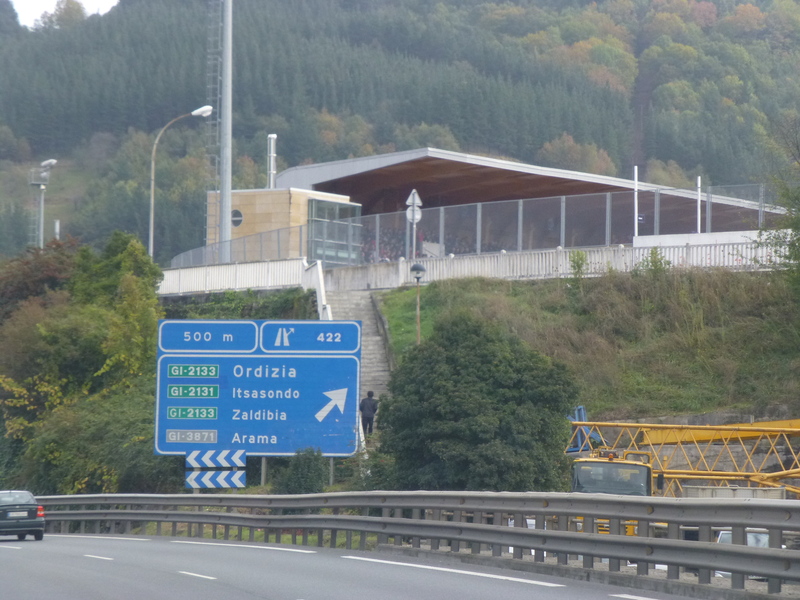 For example, it seems quite impossible just to follow the same road through Madrid because it accumulates different identities – the A4 becomes the E5 becomes the AP1 and this becomes something else, etc. 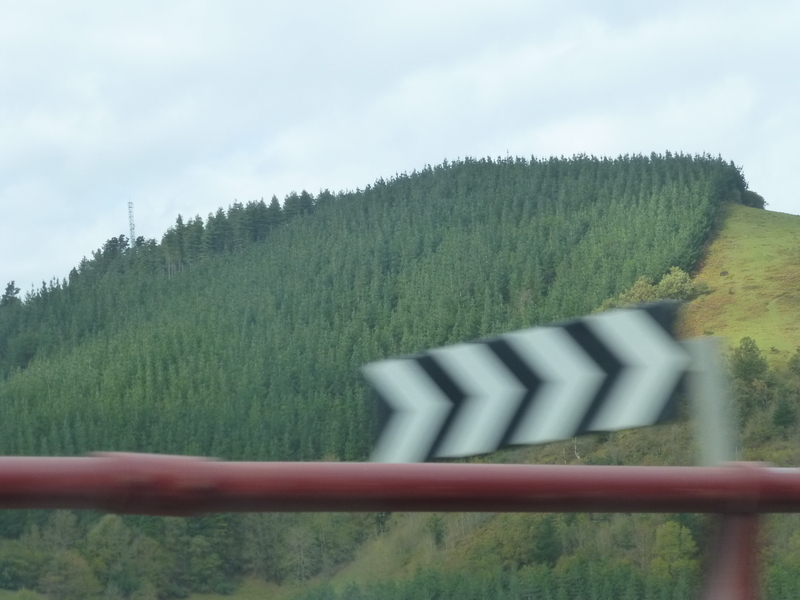 The signposts accumulate so many road numbers that you have to slow down to scan the list to check that you’re still on the right road. 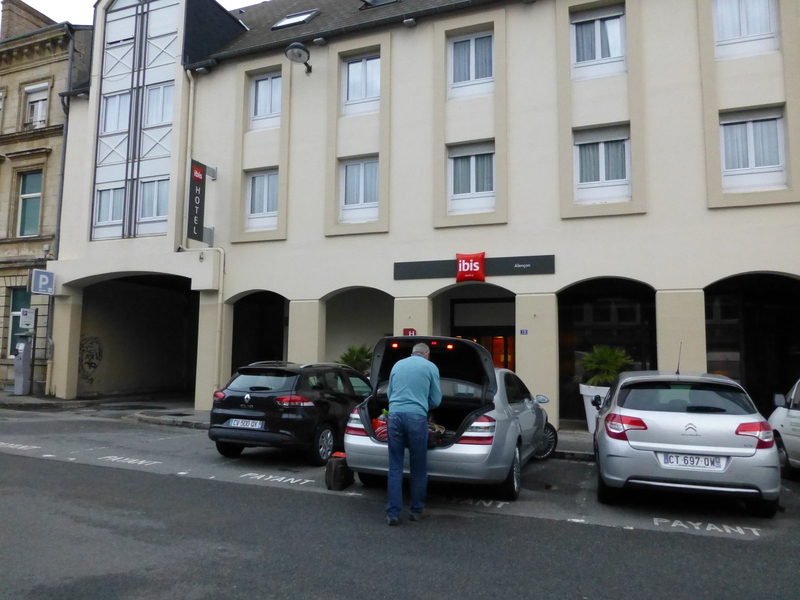 Night stop at the very basic Ibis Hotel in Alençon where, for dinner, they offered a range of microwaved meals for a minimum price of just over 17 euros each. No thanks. However, it was clean, warm and comfortable. 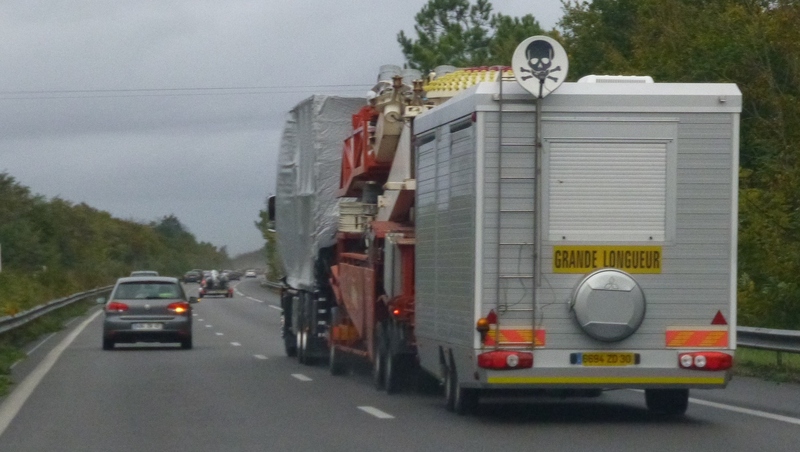 Next day we passed a convoy of four huge vehicles, three of which were articulated into three very long sections, and one was in two even longer sections. 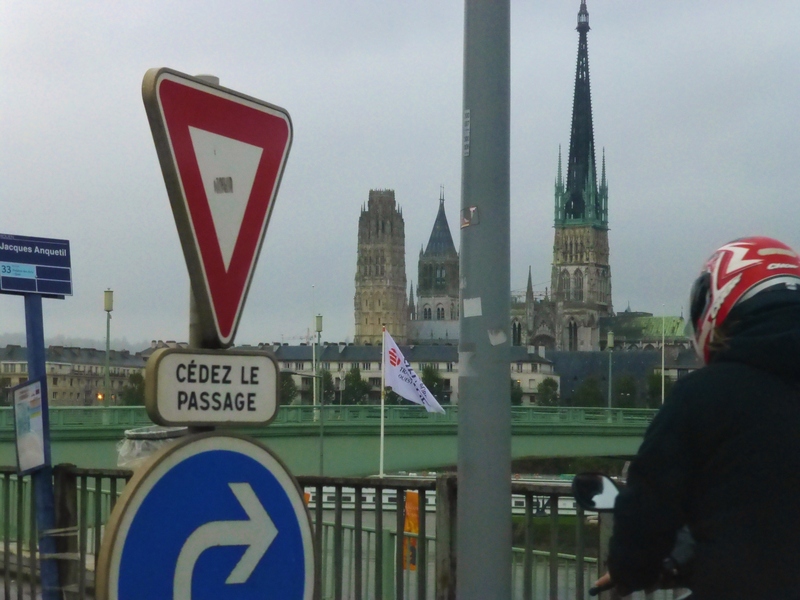 We particularly liked the skull and crossbones on the satellite dish at the back. A French circus perhaps? 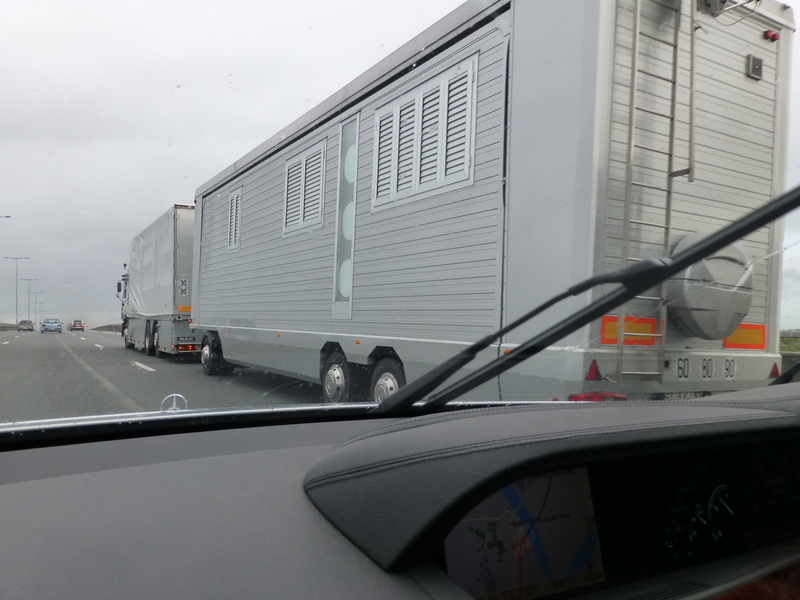 Anyway, I’ve never seen any vehicle that long on the road before. 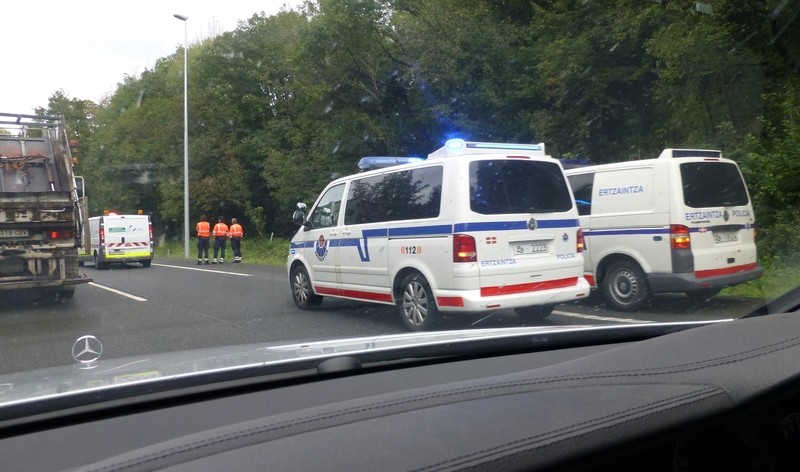 Heavy rain on a greasy, very dry road probably caused this ‘accident’, but the emergency services seemed rather surplus to requirements as the car only had minor damage to its rear end. 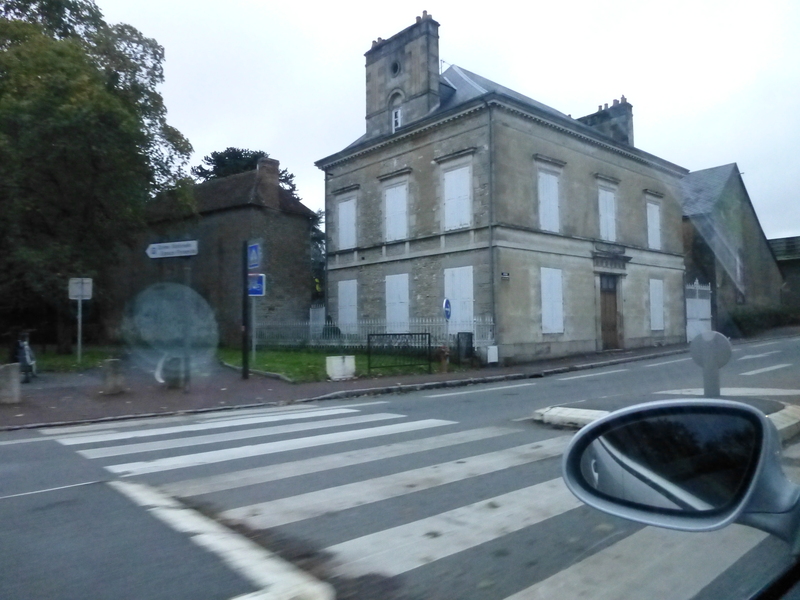 We got used to seeing the odd French chateau boarded up during our journeys, but this time it wasn’t uncommon to see the sad sight of village houses boarded up. 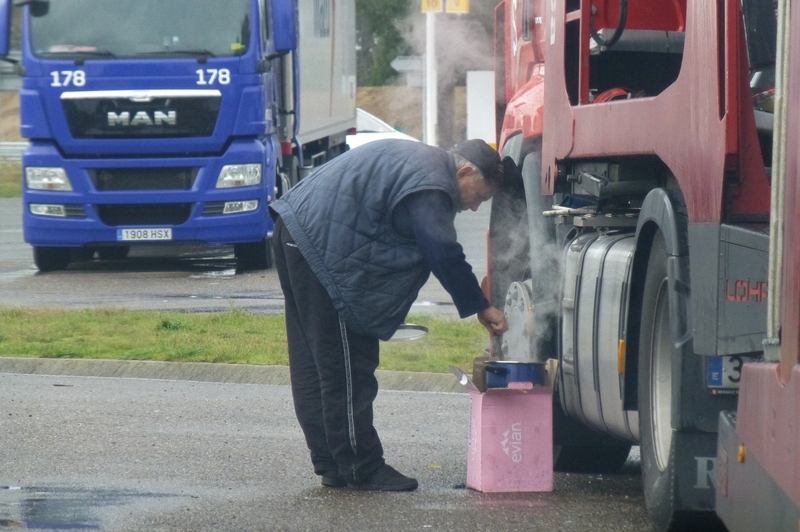 It was amusing to watch this Spanish lorry driver cook his meal on a calor gas stove in an upturned box (in the rain). 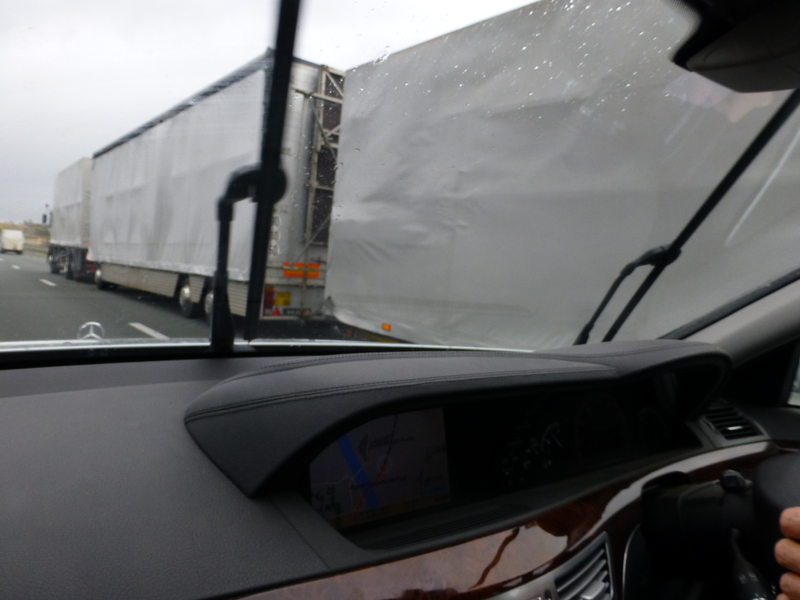 He was busy chatting to a fellow countryman in the next lorry but on the dot of 2.00pm the conversation stopped. 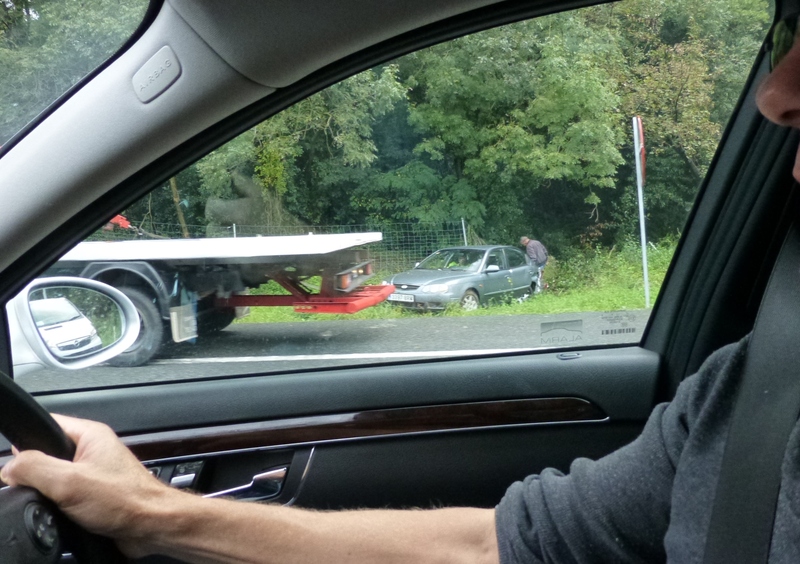 Like all good Spaniards, the chap in the lorry started munching his sandwiches, and our friend disappeared in the cab clutching his steaming saucepan. Did you see just how close the flame was to his fuel tank?!! 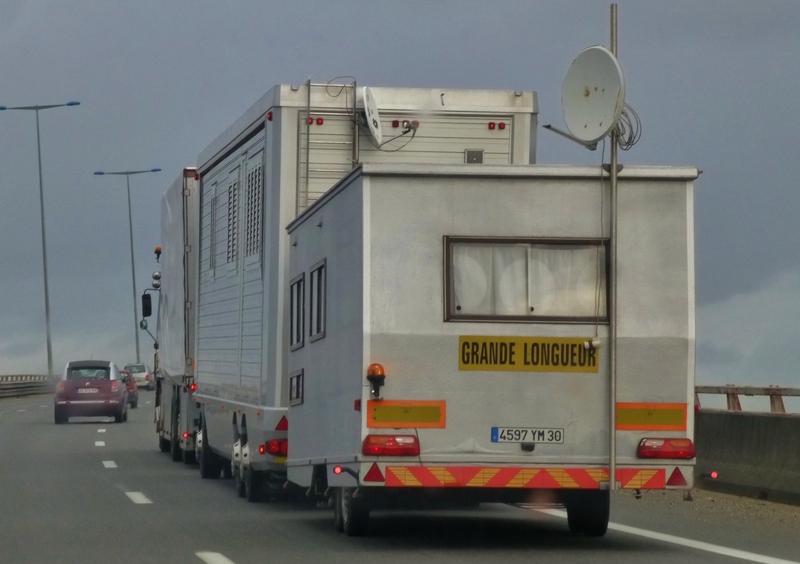 At the same place, there was a lorry with a satellite dish affixed to the cab – certainly a first for us. 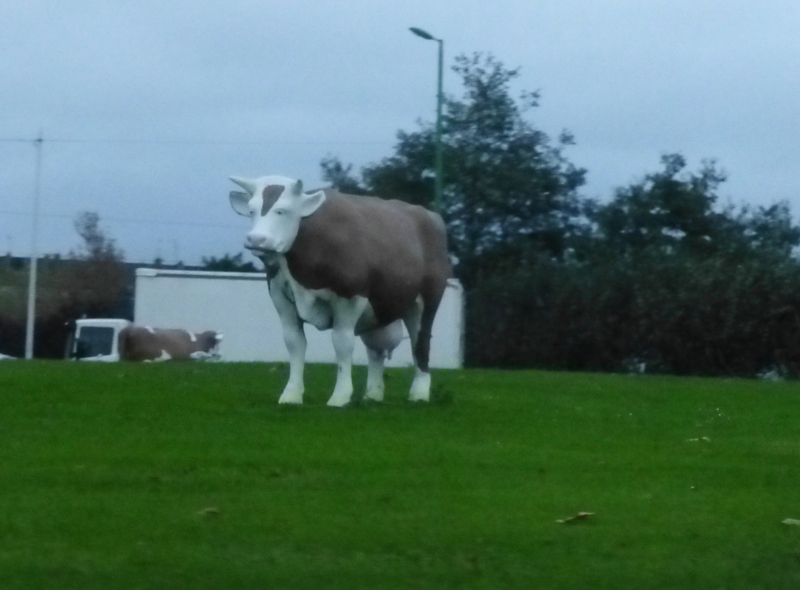 Just before Rouen there was a roundabout with a herd of life-size, plastic cows on it. What’s that all about?!! 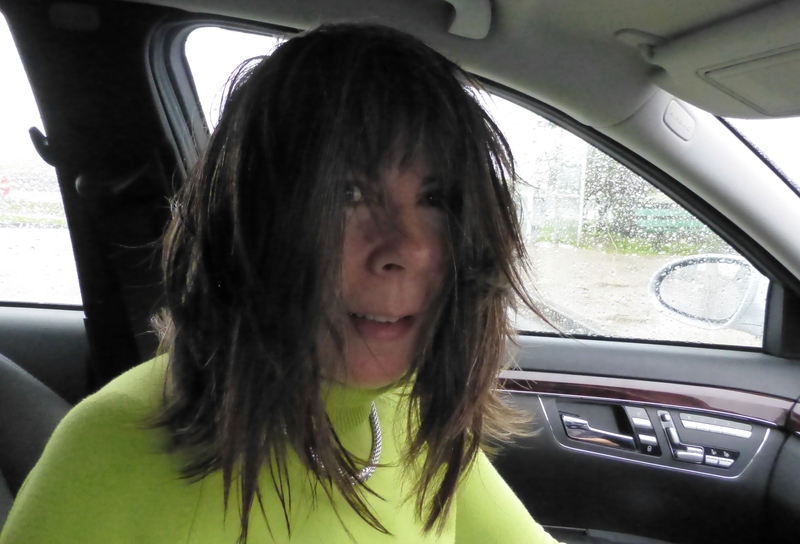 My next ‘comfort’ break coincided with the heavens opening even more, and the wind whipping itself up into a typhoon which I couldn’t escape even though parked right next to the door. What a dishevelled fright! 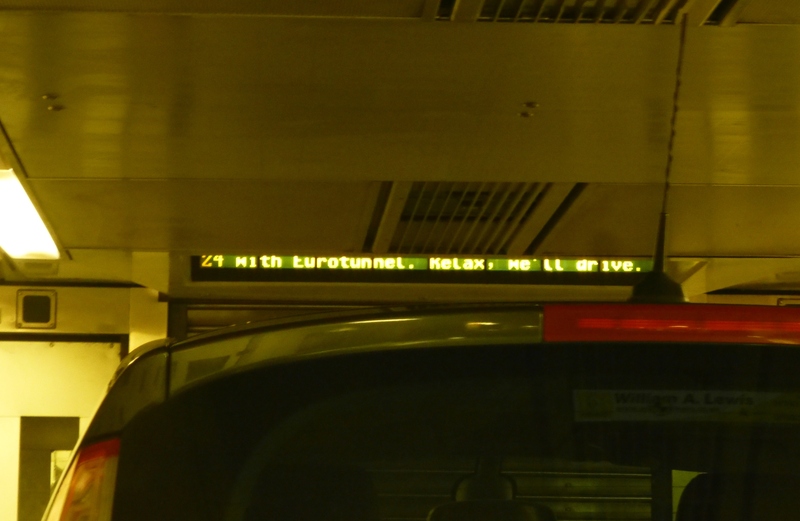 Arrived early at Eurotunnel in Calais with only 26 minutes to wait. Great! About ten minutes into the tunnel the train ground to a halt and there it stayed. There were a couple of indistinct announcements over the intercom which would have done little to allay a panic if there had been one. The beleagured attendant passing through said the train had a loss of power. Next time she said all the trains had lost power (probably due to the rain) and other trains were stuck in the tunnel. Next time after an hour she said we are going now. Fifteen minutes later we did indeed move off. Thought the LED message quite apt! Very much an amateur, I still enjoy taking good photographs which I’m sure you’ve gathered by now. 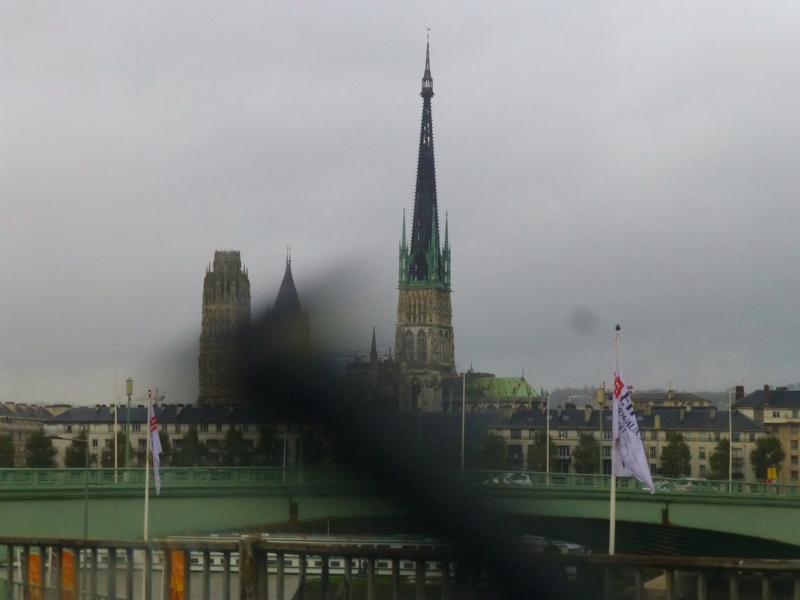 However, for all the good shots I take, there are so many failures. I certainly had a few during that journey, but rather than shove them in the recycle bin, I thought it worth a laugh to share with you. So here are some of the ones that (almost) got away. Enjoy!